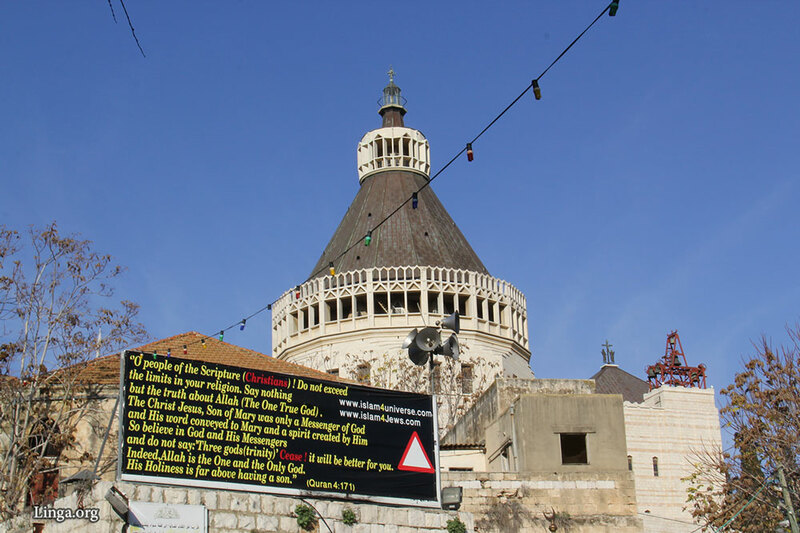 As tourists and locals alike make their way throughout the streets of Nazareth on any given day, they will find the usual sights and sounds that anyone would expect in the famous city of Jesus’ upbringing. For those who are entering the Church of Annunciation for a visit or as a place of personal worship, they are met with these words immediately preceding their entrance into the church. What a sight indeed, for those who are expecting to find Christianity in the place of which Jesus Himself grew up. According to local Israelis, the Nazarenes are too afraid in their own city to put a stop to such blatant threats and disrespect of other religions and beliefs. While there is certainly nothing illegal in Israel to voice one’s opinion or to have religious diversity - a land in which if nothing else, religious diversity bleeds from the seems of each one of its borders - there is however something considerably nefarious about a sign such as this right in front of a Catholic church. This church in fact, is the supposed place where the angel of the Lord came to Mary to inform her of her pregnancy. Not an insignificant place in the eyes of most, if not all Christians. This, undoubtedly, the reason for the Muslims having chosen the location to promote their dubious agenda. As for Christian tourists visiting the Holy Land, the common consensus - and quite frankly, normal reaction - would be and is shock. Given that Islam is a great part of Israel these days, it is still quite far from a nebulous sign that things are heating up in the country as far as threats from the more intolerable of religions. 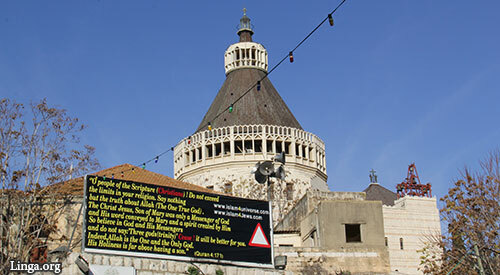 A tourist, like myself, visiting Nazareth for the first time will indeed take a moment to realize just where they are in the world when reading a sign like this. It does strike a bit of a chord in the hearts of most Christians - whether that be fear, anger, frustration, sadness or a combination of all these. While the locals of Nazareth don’t like the sign, and have their own feelings toward it, they are still too skittish toward the promotion of getting the sign taken down. Why, we may never fully understand - but we can venture a guess. 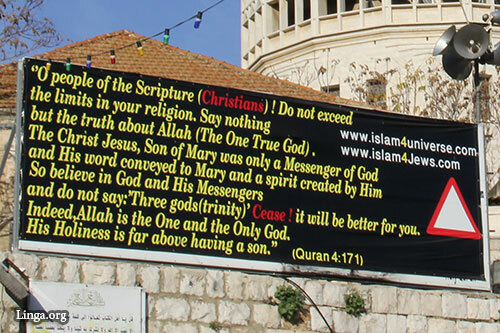 This sign gives us all the more evidence and confirmation of what some Christians alike have been saying for years and years past about Islam. It is a religion not of peace, but of intimidation and danger. Only time will tell if the Nazarenes will feel moved in upcoming weeks and months to bring the sign down, and take a stand on what is right - no matter the anger or offense it may bring.